I can't believe it's been three months since my last cabin post! If you were to conclude that it's because nothing's happened on the cabin you'd be mostly right. Progress was delayed due to the holidays then a very intense (and ongoing) period at work. At some point over the holiday break I was able to cut and install the blockers that go between the rafters to seal the roof. Damon had pre-drilled them with holes, and I simply had to staple screening to the backside and then pin them up with brad nails. I was very grateful for the use of Florian's compressor and brad nailer. 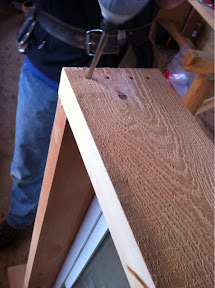 In early January we mounted a window and installed the door. 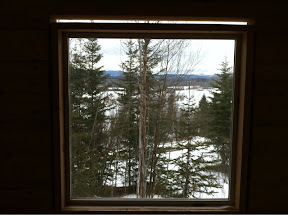 Today we mounted the other two windows. 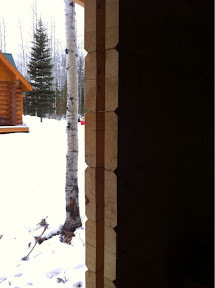 As you can see here, within the logs abutting the windows and door is a 2-inch slot, into which we inserted a 2x4. 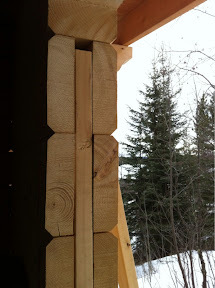 This helps brace the logs, and also ensure that if the logs shrink (they shrink only in thickness, not in length) over time, the window won't be crushed. 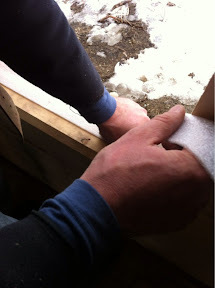 You'll also see that we've left a gap above the windows and door, which will be filled with insulation and hidden with trim, for the very same reason. 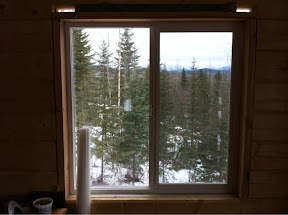 We chose vinyl windows as they were about 1/4 the price of wood-framed, and built a wood box around them with 2x6's. The bottom was left open to rest directly on the log, but we laid down some foam tape first. A 1-inch sill will be placed here later. The south-facing one (next to the door on the porch) is a 4'x4' picture window, whereas the west-facing one, also 4'x4', opens. 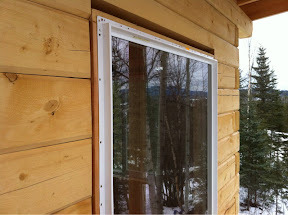 For the cross breeze, the west-facing one also opens, but is only 1.5'x4'. Tomorrow I hope to insulate the roof and fill in the gaps left around the windows.